What benefits does this York Active Bike model have over other exercise cycles? 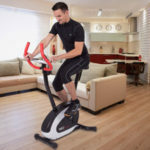 The customer reviews for this York Active 110 Exercise Cycle are generally positive and a reoccurring theme with these reports is the level of workout that people receive. This is by no means a high-tech stationary bike but it does have an appealing level of functionality that allows for a beneficial session and it does not get too complicated for novice riders. The resistance levels, inclusion of the recovery setting and the range of data on the console all make exercising easier to manage for new users and the build quality is also highlighted because of the solid, sturdy feel and and smooth operation. Other factors that have been mentioned in these five and four star testimonials are the adjustable nature of the device and the comfort but while many see these aspects as plus points, others users are less impressed. 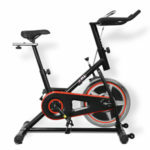 This York exercise bike is adjustable to a degree, with the seat being adaptable for users of different heights, but some buyers have noted that the placement of the handlebars and pulse sensors becomes more of a issue the taller the user is. In terms of the comfort, this is a matter of opinion because some appreciate the wide, ergonomic design while others wish there was a little more padding. These issues with the customisation and comfort could prove problematic for some users but there are other concerns that have been expressed that prospective buyers should know about. The biggest issue seems to be the console because even though it is useful when it works, there are too many issues with the installation, susceptibility to damage and faulty connections for it to really be considered a highlight of the design. Another negative factor is the assembly because many buyers have had difficulty getting all the parts together smoothly on the first attempt and found the machine is a little noisy if it is not properly assembled. Thankfully, when it is assembled well it is quieter than people expect. Summary: should you buy this York Active Exercise Bike? This 110 model is a great machine for beginners because it is easy to use once it is set up, has an understandable display and enough resistance levels to do the job without being intimidating. However, it is less desirable for larger users because of the adjustment issues and it may not be ideal for experienced, fitness fanatics because of its simplicity and limitations. 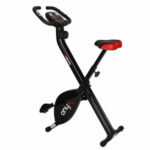 Overall, this York exercise bike has its advantages and when the console works it helps people get a great workout. If you want a simple, informative and capable gym bike then this machine could be enough for your needs. 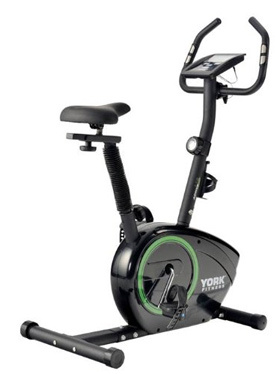 Find more reviews about this York Active 110 Exercise Cycle on Amazon here.